Like all parts to the anatomy, the hock of a horse is important to the mobility of the horse. The hock is located approximately midway down the hind legs of the horse. Ideally, hocks are slightly higher than the knees on the front legs, with the point of hock level with the chestnut of the front leg. It is the joint that moves in a backward motion, opposite to forward motion of the front knee. This particular joint must be strong enough to take the thrusting power of the hind quarters of the horse, plus the horse’s weight and the weight of a rider. The hock is made up mostly of bone and tendon. The muscles that flex and extend the hock are in the upper leg. From the rear, a good hock should appear rectangular and bony, without any lumps or swellings. It should be noticeably wider than the long, relatively straight cannon bone below it . From the side, it should appear clean and bony, with no lumps above or below it. Since the horse’s main source of power is in the hind quarters, they have evolved a thrust that can take them into a flight situation, to avoid a predator. This powerful thrust can also hurdle them over high jumps with the weight of a rider and equipment, up to a third of their own weight. All of this pressure becomes centered on the hock joints. There are many things that can go wrong with the hock, because of the type of pressure and the weight, the horse puts on the joint and it is essential to watch for problems. Swellings, ripped tendons, bruised bone can and do happen and it is necessary to use quick remedies such as massage, hot/cold baths or liniments and wraps for the minor damage, much as a human would do for a twisted, swollen ankle. A limp may also indicate a damaged hock. Sometimes a horse may be born with one or both hocks formed improperly. When looking at the conformation of a horse, look deeply at the hocks. If the hock is higher than normal (short gaskin), then the horse may have a downhill balance with the croup (rear quarters) higher than the withers (shoulders). This is often seen in race horses or gaited horses and it can result in a sickle hock conformation. If the hock is lower (long gaskin) then normal, it gives the appearance of a squatting horse. Stock horses often have this squatting look. The long muscle has reduced efficiency to drive the limb forward, making it hard to engage the hindquarters. It reduces the rear stride length, forcing the horse to take short steps. If the hocks appear too small, then the horse can develop strains and tendon ruptures more easily because the hind quarters are placing more pressure then the hock can handle. If this is the case, the horse may be used in pleasure riding or light carriage work. Something that won’t force the hind quarters to thrust forward so hard. These conformation faults are but a few of the problems a hock could give a hor se. There are many other undesirable shapes for hocks to be. It could be cut out under the hock in front, or less of a bend causing the leg to be “camped out” or behind the point in the buttocks. They could be sickle or sabre-hocked, over-angulated long hind legs, where the legs are in front of the point of the buttock. They could cause post-legged or straight behind legs, where the angles of the hock and stifle are open, leaving the leg in a vertical position, rather then at the normal 60 degree angle. They could cause bowed legs or be wobbly hocks or even cow hocks, which is a medial deviation. 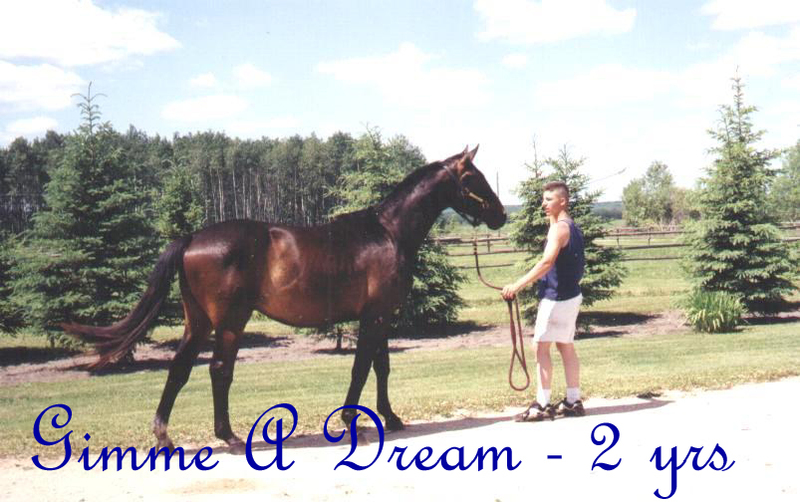 My Gimme A Dream has post-legs or straight back legs. He also has them in the picture as a two-year-old and yet he sold for $6,000CDN. Why? Apparently his purchaser was told that he would probably out grow the condition. His pedigree is Hanoverian/Thoroughbred. He has full blood brothers and sisters, none of whom have his condition. His father might have been retired from breeding after Gimme’s birth because I can’t find any other foals after Gimme’s birth from him. His siblings all sold for a minimum of $10,000CDN. I imagine he was bred and sold in the hopes of having a champion show horse in the field of jumping/hunter. Gimme A Dream is here on the Magdalen Islands because the soil and the sand are soft enough to help ease any pressure his great weight puts on his poorly angled hocks. He has had to have fluid drained off his hock with the white foot, before he arrived here. Because the hock is angled so poorly, the weight of his hind end is lowering the pasterns on his hind legs. I have asked at a equine hospital who works heavily with farriers in Kentucky. They seem to think that specially made shoes will not help his situation, because the problem is the hock and not the pastern. When looking to buy a horse, first know exactly what you want your horse to do. Then look at the hocks and make sure that the hock has a shape and a location on the leg that can handle the work you intend for it. Don’t decide to have a jumping athlete, by the pretty face of the horse. Choose your animal with care because there will be a lot of heartache, when something goes wrong. You wouldn’t ask a Shetland pony to do the work of a draft horse, so don’t ask a horse with a infirm hock to do the work of an athlete. Learn more about this author, Gimme a Dream. YouTube video with vet explaining the anatomy of a horse’e leg with a horse, x-rays and scans.